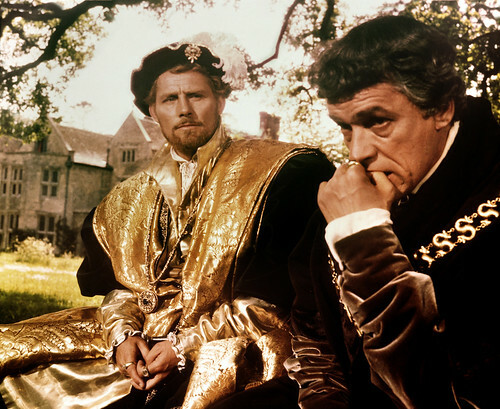 This week's pick is the Tudor classic A Man for All Seasons (1966), starring Robert Shaw as Henry VIII and Paul Scofield as Thomas More. The scandalous lives and loves of the turbulent Tudor dynasty attracted their fair share of old Hollywood adaptations, from the great Charles Laughton hamming it up in The Private Life of Henry VIII (1933) to Bette Davis' brilliant portrayals of the aging Elizabeth I in The Private Lives of Elizabeth and Essex (1939) and The Virgin Queen (1955). Henry VIII and his children continue their unprecedented popularity with successful films like The Other Boleyn Girl and popular TV shows like the prestigious BBC production, Wolf Hall. Today, we're going to look at A Man for All Seasons, one of the best old Hollywood films about the Tudors. A vintage poster for A Man for All Seasons (1966). A Man for All Seasons tells the story of Henry VIII's chief minister Thomas More (Paul Scofield). He is portrayed in the film as a paragon virtue: absolutely incorruptible in politics, a devout Catholic, and a devoted family man. Henry (Robert Shaw) deeply respects More, but they have a fateful disagreement when Henry decides to divorce his wife, Catherine, to marry Anne Boleyn (Vanessa Redgrave). 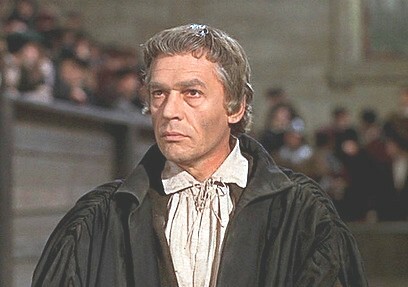 Thomas More (Paul Scofield) is on trial for his life in A Man for All Seasons (1966). A Man for All Seasons started out as a stage play by Robert Bolt, who also wrote the screenplays for Lawrence of Arabia (1962) and Doctor Zhivago (1965). The first version of A Man for All Seasons was a one-hour play that the BBC adapted for radio and television in the 1950s. Bolt later re-worked the material into a full-length play that debuted on London's West End in 1960. The play was a moderate success in London, but it became a sensation when it arrived on Broadway in 1961, earning critical praise and four Tony Awards. 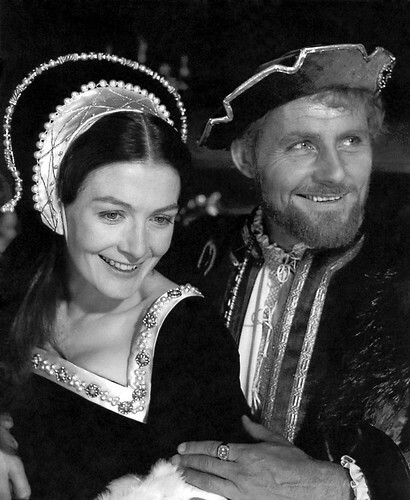 Anne Boleyn (Vanessa Redgrave) and Henry VIII (Robert Shaw) in A Man for All Seasons (1966). Director Fred Zinnemann and Mike Frankovich, a Columbia Pictures executive in charge of production, admired the play, but they had a difficult time convincing others at the studio that audiences would flock to see a costume drama about a 16th century "man of conscience" battling with his monarch. Zinnemann wanted Scofield, who played More in London and Broadway, to have the lead role in the movie, but Columbia executives wanted a big-name star, and they pursued Richard Burton and Laurence Olivier without success. The studio finally relented and gave Scofield the part. In the end, there were very few stars in A Man for All Seasons, mostly because a lot of big names, including Alec Guinness and Peter O'Toole, said no. The only marquee names left were Orson Welles as Cardinal Wolsey and a cameo appearance by Redgrave as Anne Boleyn. 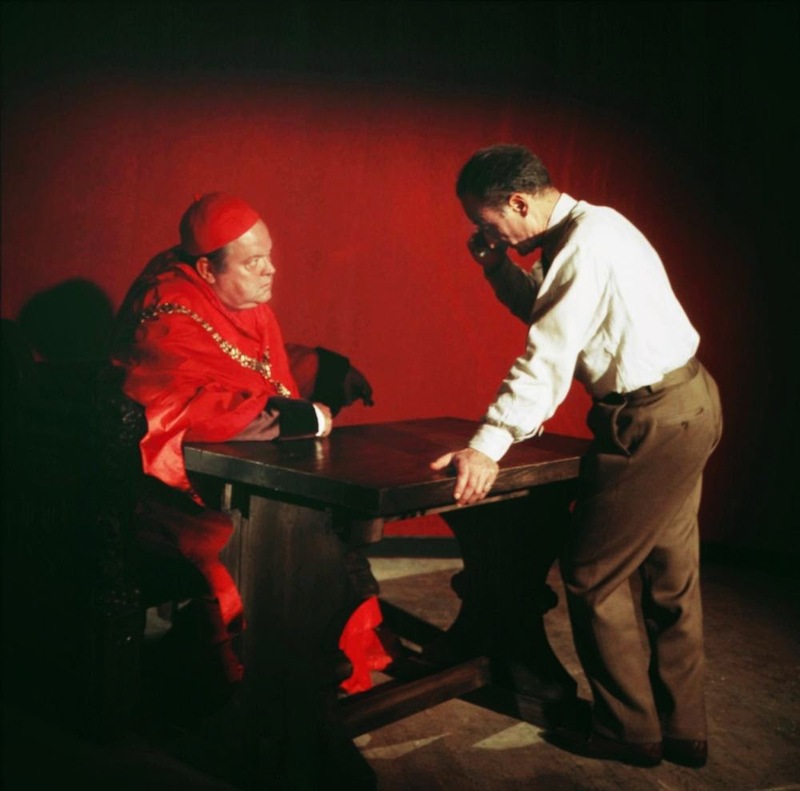 Scofield and Australian actor Leo McKern, who took the pivotal role of Thomas Cromwell, were the only veterans of the stage play to appear in A Man for All Seasons. Orson Welles gets some pointers from director Fred Zinnemann while filming A Man for All Seasons (1966). A Man for All Seasons was a huge hit when it debuted in 1966. The film earned critical raves and six Academy Awards, including Best Picture and Best Actor for Scofield. A Man for All Seasons still holds up today as one of old Hollywood's best Tudor adaptations. The film benefits from location shooting in English countryside and authentic costume and set designs. Scofield is excellent as More, although his performance is somewhat mannered, probably because he had already played the part hundreds of times. The rest of the cast are phenomenal. Shaw is still the best Henry VIII I've ever scene on screen, Redgrave nails Anne Boleyn in about five minutes of screen time, and Wendy Hiller gives one of her best performances as More's longsuffering wife. The clip below features some of the wittiest lines from A Man for All Seasons. In many ways, A Man for All Seasons is the reverse image of Wolf Hall, another highly successful work about one of Henry VIII's ministers. A Man for All Seasons portrays More as the ultimate "man of conscience" betrayed by the sniveling Cromwell, while Wolf Hall features Cromwell as a pragmatic fixer who loathes More because he is a religious zealot who burns "heretics" for reading the Bible in English. I'll leave the historical accuracy of both works up to the experts, but both A Man for All Seasons and Wolf Hall are certainly worth watching. They actually make great companion viewing because of their vastly different portrayals of the same events. A Man for All Seasons will air on TCM at 10 p.m. June 22. It is also available on DVD and video on demand.